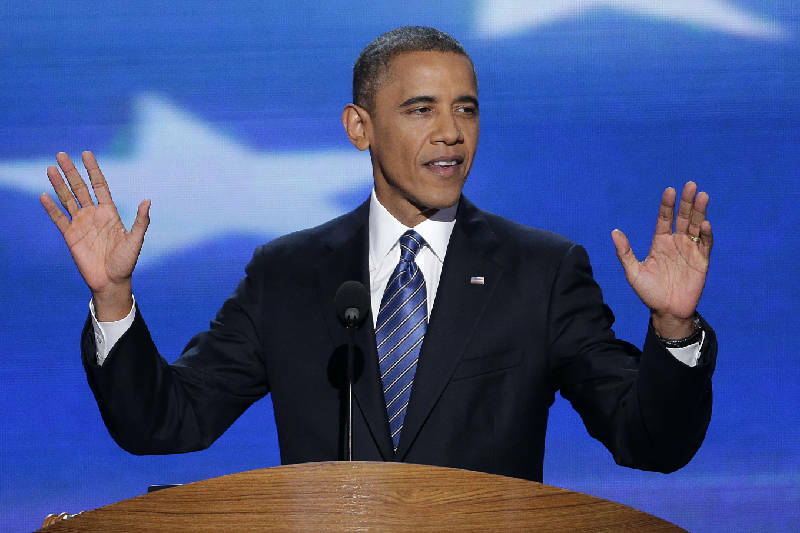 President Barack Obama addresses the Democratic National Convention in Charlotte, N.C., on Thursday, Sept. 6, 2012. With polls consistently showing the presidential election will hinge on the electoral votes of tight races in 10 pivotal battleground states, endorsing a presidential candidate might seem a futile exercise in states like Tennessee, where the electoral tilt is considered etched in stone. Still, it's worth the drill to explore the merits and demerits of both candidates in terms of how their policies wound affect average Americans. Average, by our lights, includes Americans up to the bottom rungs of the 90 percentile in incomes. The top one percent of the income ladder --mainly the top tenth of 1 percent -- capture a fourth of all the nation's income and own roughly 35 percent of America's net worth. The top 10 percent as a whole control 73 percent of America's net worth. The bottom 90 percent control just 27 percent of American's wealth and have an average income of barely $31,500. Indeed, it takes a family income over $161,000 to crack into the top 10 percent. As this widening wealth gap suggests, most of the nation's inflation-adjusted wage gains in the past three decades have gone to the top 10 percent. Conversely, inflation-adjusted wages have stagnated or declined for virtually 90 percent of Americans in the same period, requiring most families to hold two or three jobs and to give less time and attention to their children, community and civic life. President Obama policies would do much to help the bottom 90 to 95 percent of families. By contrast, Romney's policies would largely unravel, and ultimately devastate, the earned entitlements, safety-net programs and women's rights most needed by average Americans. They also would significantly widen America's wealth gap, already worse than that of any other modern industrialized nation. The policies we consider include: secure and affordable health care for average Americans; support for public education and college; living-wage jobs; Social Security and Medicare improvements; community, state and national infrastructure; clean air, water and energy; banking regulation and credit-card fairness; fairer taxes; wage and health care equity for women; economic opportunity; and national security and cogent foreign policy. In all these areas, Obama's specific policies, including many already in place, and administrative direction trump all of Romney's proposals and direction. By his own policy promises, in fact, Romney would take the nation backwards in virtually all of these areas. President Obama demonstrated his steady leadership and proved his mettle from day one by stabilizing an economy that was in a disastrous free-fall when he came to office. His pursuit of terrorists and effective international alliances have proved his toughness. He's shown his character across the board by pursuing humane social policies -- education, health care, women's rights, tax fairness, job training, fairness to immigrants, rescuing the auto industries. His stimulus package, despite the rhetorical attacks of Republicans, worked well. It provided substantial tax cuts to the broad middle class, funded new infrastructure and significantly helped stabilized state governments with three years of budget supplements (Tennessee got $5 billion) to sustain vital services and education and to reduce layoffs until the economy began improving. Though the Great Recession of 2007-09 destroyed 8.8 million jobs, Obama's job recovery effort -- virtually always without the support of Republicans -- has achieved 32 consecutive months of employment growth, and more than 5 million new private sector jobs. Obama and economists, due to the lag time on economic data, did originally underestimate the depth and duration of the Great Recession, and its downside has conveniently given fallacious fodder to Romney's campaign. Yet nearly all of the bad statistics used by Romney to disparage Obama's administration actually did result directly from the economic crisis Obama was handed, and not from his recovery policies. The largest chunk of the current $16 trillion in national debt, for example, came in George W. Bush's term, and in the pipeline of ensuing debt from two wars and the ripple effect of deep tax cuts, all on borrowed money. The national debt was $5.6 trillion when Bush took office, and over $12 trillion with the budget and $800 billion bank bailout he left for Obama's first year. With tax revenue ravaged by recession (down to less than 16 percent of GDP from the 18.5 percent norm) and the debt hangover Bush left in the post-2009 pipeline for his wars, military rebuilding and reckless tax cuts, it was impossible for Obama to produce a balanced budget without pursuing deep spending cuts that would have thrown the nation into a double-dip recession. His budget plan now, the nonpartisan Congressional Budget Office confirms, would cut chop $4 trillion off the national debt over the next 10 years. Romney deliberately distorts this picture to make promises that he can do better, but he won't say how. His prescription mirrors the policy and budget debacle of George W. Bush's trickle-down baloney. It's built on tax cuts for rich corporations and the wealthy elite, along with deep cuts for earned entitlements and vital services for the middle class. Romney specifically proposes to cut taxes by $6 trillion: his own new 20 percent across-the-board cuts costing $5 trillion, plus another $1 trillion to keep the Bush tax cuts intact for the top 2 percent. He further proposes $2 trillion more in defense spending. He deceives voters on the effect of his tax cuts, and their addition to the national debt, by refusing to disclose how he would pay for them, and what tax loopholes he would close on corporations and the very wealthy. But you can be sure the burden would fall on the middle class, and national debt would rise. Romney simply says that he won't reduce the relative "share" of taxes that the wealthy pay. Which is to say, the richest will get disproportionately huge cuts again, as they did under George W. Bush's cuts on dividends and capital gains. Here's why. More than half of the value of the Bush tax cuts on dividends and capital gains went to the top-tenth-of-one percent, the super wealthy with average annual incomes of more than $27 million. They got an average tax cut of nearly $330,000 a year; ordinary Americans got a few hundred dollars in Bush's tax cuts. That's a fair "share" by Romney's standards. He still claims that his own tax rate of 14 percent under the Bush cuts, mainly in dividends and "carried interest" on investments, is fair. Never mind that many Americans pay a far higher tax rate, or that few can equal his $250 million fortune and the tax rules that enlarge it. Romney has also flip-flopped on nearly every tough issue around: abortion, health-care reform modeled on his own Massachusetts plan, college aid, vouchers, gun rights, coal-fired electric power plants, energy efficiency, climate change, science versus creationism, government investments in innovative technologies. You name it, he's flip-flopped on it, because his character and beliefs are based on who he's talking to at the moment, and not on deeply seated principles. Small wonder he pretends to be tough on China after shipping thousands of jobs there; or that he won't reveal his taxes from 2000 to 2010 after off-shoring tens of millions of dollars in foreign tax havens through his venture capital firm, Bain Private Equity. There really is little reason to vote for Romney other than false hope for a pretender. Obama, on the other hand, is the real deal. He is a genuine, authentic leader whose heart is not in a private equity firm and minimizing his taxes, but in looking out for average Americans even when half of Congress made it their "first priority" from the get-go to defeat him this year. Had he been given just a little bipartisan help in his first term, the country and economy would be far stronger, and he would win this election in a landslide.